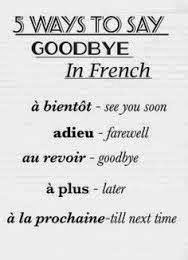 Ten tips on saying goodbye cont. Tips 1-3 in the previous blog on goodbyes. 4. Be honest with your goodbyes. Say what you feel and when it comes to the final parting, don't draw it out. You have to part some time. In Wikihow method two, long term goodbyes suggest being brief and sincere. 5. Offer a memento, a photo, a card, a souvenir of your time together. It may be worth giving the gift before the airport. A metre tall cuddly toy may not be welcome at the last moment. Great for cuddling but it may not fit in the baggage plans of the person leaving. Smaller items need thought through too. I once had to turn down a goodbye gift because it didn't meet airline safety specifications. 6. If you are visiting your homeland or your loved ones are visiting you, toast the goodbye in a place that you enjoy being in, one that you can have good memories of. A last meal, a pleasant walk. Talk over some of the good times you have had. 7. 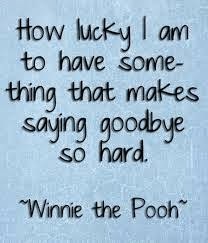 Realise that in the build up to saying goodbye, there maybe anxieties or unusual behaviour. Either party is upset at the prospect of loss and this may be shown in being easily irritated or angry. Be aware that the anger is not directed at you but at the situation. Perhaps suggest that it is a tense time for you both. Be gentle with each other. Read more from Swedish Psychologist Dr Julie S. Lungdren and the first half of the article "How to keep the 'good' in goodbye in the Wall Street Journal. Whether you believe in God or a greater force or not, the meaning of good-bye is a feeling of protection and well wishing between people saying goodbye. Ira Byrock in "The Four Things That Matter Most " reclaims the traditional meaning of "good-bye" as "God be with you - a blessing that we can all use, whether parting from someone for an hour, a day, or at the end of a lifetime." My was father dying and I was about to fly to see him hoping he didn’t die before I arrived. At the departure gate, I hugged my husband and three children aged four, three and one. Entering the neutral area of custom-control, I suddenly felt very lonely. Being in this transit area I was in a place where I belonged to no-one and yet I was getting ready to say a final goodbye to my father. The comfort of another person would have been a help. What made it better? Bustle of practicalities. Knowing that I had a good seat. Having time, twenty-eight hours at least, to let my mind wander as it wanted to, a kind of meditation, as I knew once I was in near my father, it would be emotional again. The expat child suggests ways to make saying goodbyes easier for children. These suggestions are just as applicable to adults as at times like saying goodbye we often melt into being an inner child. 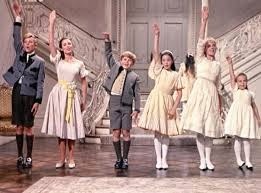 How can you not love the cheery and cheesy "So long, Farewell" from the timeless "Sound of Music." Click here if you can't resist hearing it again. The final tips on easier goodbyes will be in a blog in April. Keep an eye out for the March newsletter with new topics for discussion. I would love to hear your goodbye stories or comments.